The Red Army and its Soviet armed forces were born out of the chaos and confusion of the Russian Revolution. In November 1917 the Bolshevik Pany, under the iron leadership of Vladimir Ilyich Ulyanov (Lenin), mounted a successful coup d'etat to seize power in the Russian capital Petrograd. The Bolsheviks we re aided by a number of disaffected army regiments and their own crudely armed and trained workers militia, which was rather grandly called the Red Guards. On 28 January 1918 these forces were re-named the Workers and Peasants the Red Army and tasked with the role of defending the revolution from the right-wing antiBolshevik forces, which were now known generally as the Whites. During the course of the Civil War (1919-1921) on 4 July 1920 the Red Army fought its first tank action. This was a combined action involving the 2nd Tank Squadron, Armoured Train number and Armoured Car Squadron number 14. The infant Soviet tank park was comprised of a modest number of British Mark V and Medium B Whippet and French Renault FT ranks. These vehicles had originally been supplied to the Whites by the Western powers to aid them against the Bolsheviks, who had managed to capture a number and turn them against their former owners. In the Civil War, tanks played only a minor role on both sides. The most obvious reason for this was lack of numbers. The British and French are estimated to have supplied the Whites with no more than 130 tanks. although it seems that a far larger number of armoured cars were sent. The ranks themselves were slow, mechanically unreliable, and lacked spares and fuel. Consequently, they were unsuitable for extensive lise alongside the more rapid cavalry units employed in the deep mobile operations that were a characteristic of much of the fighting in the Civil War. Armoured trains had a greater impact than tanks, possessing high mobility coupled with substantial firepower, in a conflict in which securing railheads was often a key feature of engagements. At the same time the Red Army did devote much time and attention to its punitive armoured forces. The Bolsheviks had formed a Provisional Armoured Board as early as November 1917, with orders to oversee the Second All-Russian Armoured Car Conference, which was to discuss matters relating to the establishment of Soviet armed forces for the new Soviet state. These organizations were replaced in 1918 by the R e"olutionary Military Council (RSVR) which took practical steps to establish tank detachments. The first dedicated tank units were formed in May 1920. Each consisted of three British-made MK V tanks, with six lorries and three motorcycles. As more types of vehicle were improvised or captured, the Soviet armed forces were re-organized into three main groupings, according to the size of the tank. The Mark Vs constituted Type B bolishie (large) units; Whippets were placed in Type S srednie (Medium) units: and the FT tanks in Type M malie (light) units. This organization was more concerned with logistic matters and ease of coordinating the tanks, rather than any sophisticated ideas concerning the tactical role of different tank types. Yet, it is worth noting that the division of armoured forces into groupings based on the size and capabiliti es of tank types did become a characteristic feature of Soviet organization during the interwar years and World War II , and was strongly related to their use in combat. In the immediate aftermath of Bolshevik victory in the Russian Civil War, the Red Army continued to show interest in armoured warfare. especially the creation of native means of production to replace captured westan vehicles. War Commissar Leon Trotsky, the man often accredited with laying the foundations of the Red Army, wrote that tank factories should be created to supply the Soviet Union's requirements. In fact. 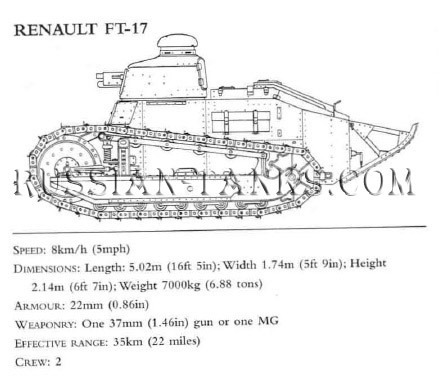 as early as 1919. a team of technicians under N. Kruhlev had set about reverse-engineering the French Renauir FT tank at the AMO (Automobilnoye Moskovskoye Obshchestvo) Factory. which had been newly nationalized. 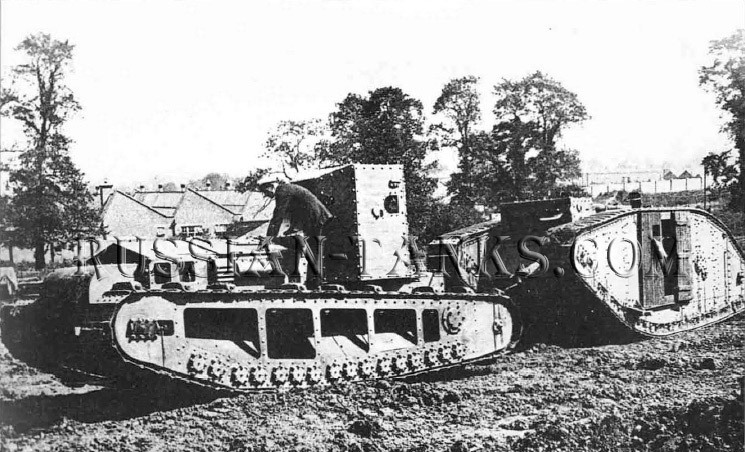 The decision to try and reproduce the FT tank was taken on the grounds that it was smaller and simpler than the other types of vehicle that had been captured. Although one vehicle was produced. Soviet claims of 14 vehicles seem extreme. considering the run-down state of Russian industry in the immediate aftermath of the Civil War: it is more likely that these tanks were refurbished FTs, not new vehicles. Lack of industrial resources and technical skills also prevented the large number of original Soviet tank designs produced between 1919 and 1924 from progressing beyond paper concepts. Tank development was also inhibited by the deSigners often fanciful and over-ambitious aims. 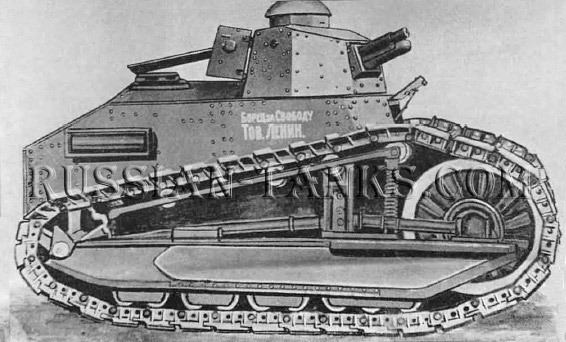 A the Red Army competition to design an armoured fighting vehicle in 1919 was won by a team from the Izhorskiy Factory whose Tyeplokhod Tipa AM (Motor Vessel Type AM) was a 10.1 tonne (10 ton) amphibious tank mounting a 76.2mm (3in) gun. The over-complication of the design and insurmountable technical problems forced work to be suspended in 1923. Despite these setbacks, the Soviets continued to set up organizations to consider the design, organization and use of armoured forces. 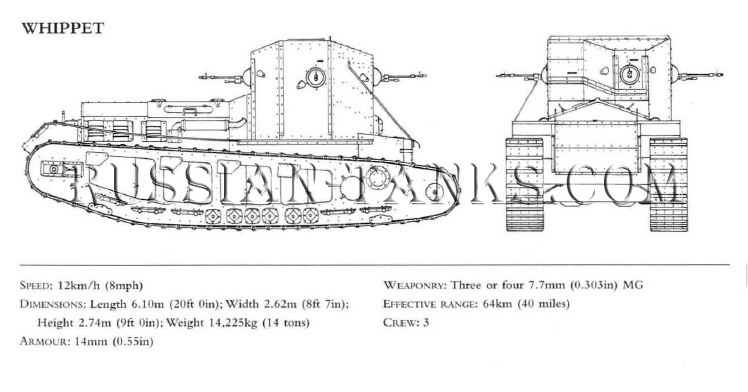 In 1923 rhe War Industry Main Directorate undertook the first systematic study of tank design in relation to the Red Army's requirements in war. This analysis contained a survey of tank actions from 1916 to 1918, and drew up outline proposals for training a cadre of tank men. The push towards acquiring a tank arm was furthered in 1925 with the establishment of a Technical Bureau for Tank Study. This body was largely responsible for directing the efforts of a recovering Soviet industrial base with the aim towards designing the first large-scale production tank of the Red Army in 1926, called the MS-I and subsequently known as the T-16/18. 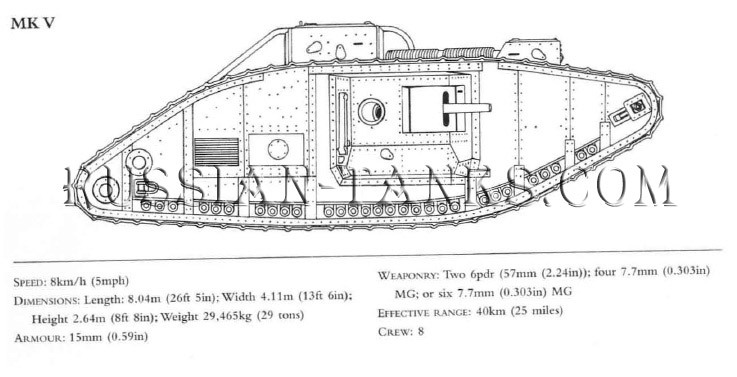 The MS-1 or T-18 had its origins in a three-year plan drawn up in 1926 to produce a number of tanks to provide close support to infantry whilst breaking through enemy defences. A number of foreign designs were considered by' the Red Army in order to speed design and production. Initial studies favoured the adoption of the Italian FIAT-3000 over the French Renault FT, or its Soviet modified variant the KS-I. because, of its lower weight and rel at ively high speed. The accuracy and weight of the FTKS tanks was considered inadequate, and so too was the overall poor quality of the workmanship. The tirst prototype was built by the Bolshevik Factory and was ready for trials in March 1927. Designated T-16, it performed adequately, but a number of improvements were recommended. including the addition of another road wheel and alterations to the transmission. Final tests on the new model were conducted in mid-1927, with the vehicle re-designated as Small Support Tank Model 1927, or T-18. Lack of a gun led to concentration on road tests, during which the T-18 was judged to have performed effectively and it was afterwards recommended for service. The Red Army ordered 108 vehicles to be built between 1928 and 1929, and the first 30 were avai lable to take place in the 7 November 1929 Moscow and Leningrad parades celebrating the revolution. However, production of the tanks had been difficult because of lack of facilities at the Bolshevik Factory to manufacture certain components, such as ball-bearings and carburenors. Eventually the required parts had to be imported, but even then the tanks delivered to the army were plagued with technical difficulties. Later field tests in 1929 revealed that the T-18 had problems in crossing trenches. This was rectified when the commander of the Leningrad Region Armoured Force ordered the fining of a second tail at the front. The appearance of the tank with its iron struts at the front earned it the nickname Nosorog(Rhinoceros). Although the T-18 remained in production until the end of 1931, as early as july 1927 the Revolutionary Military Council had stated that it was unsuitable for the conditions of modern combat, and consequently it was to remain in service only until a successor was available. In line with this, several modifications were undertaken to the T-18 as a stopgap. There was some discussion about replacing the copied French Hotchkiss 37mm (1.46in) gun with a new, highvelocity version, but no thing was done. The turret was extensively re-designed in order to crente space for a radio, although not all tanks received radio. The most important changes involved measures to increase the T-18's speed and mobility. The engine's power was in creased to 29kW (40bhp) and a new gearbox and cast wheel drive were introduced. However, these measures failed to significantly increase the rank 's overall performance, and later programmes to update the T-18's fun ning gear in 1933 and in 1938 also failed to achieve any improvement in performance. Despite the unfavo urable opinion expressed about the T-18 soon after its acceptance by the Red Army, over 989 were produced between 1928 and 1931, and they saw successful, if limited, combat service, fulfilling their role of direct support to the infantry, In 1929, nine T-18 tanks S3W action in the Far East in border clashes with Chinese forces. In one engagement, eight T-18s supported the attack of the 106th and 108th rifle regiments against Chinese forces dug in around Dzhalaynor Station. In one attack, the infantry advanced behind the cover of rhe T-18s against Chinese positions. The tank crews operated with skill, providing fire support with their guns as well. A later attack was less successful because the tanks initially couldn't cross an antitank ditch. Later several vehicles managed to get inro the enemy ltne), sweeping them wirh concentrated fire. By the time of the outbreak of war with Germany in june 1941, few T-18s were left in running order. In 1938 over 700 were ordered to be re-armed and used as mobile firing points in the fortified regions along the borders with Poland and Romania. Some T-18s did see action during (read also Tanks in action) the opening days of the war with 9 Mechanized Corps during the large tank battle in the Rovno-Broda-Lutsk area. However, these had been deployed almost randomly in a desperate attempt to replace the massive losses suffered amongst the corps more modern BT and T-26 tanks during the previous weeks fighting.